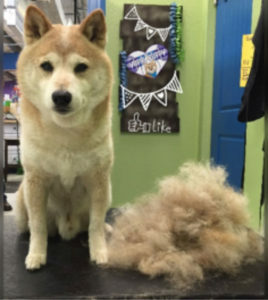 A heavy deshedding treatment on DuraMax, a Shiba Inu resulted in this hair pile big enough to make another dog! Double-coated breeds have a coarser, protective overcoat and a soft, fluffy undercoat. These breeds include Huskies and Malamutes, Chow-Chows, Pomeranians, Great Pyrenees and Newfoundlands, Shiba Inus (a personal favorite), and many other breeds. This undercoat is responsible for all the hairballs floating around your house and cars, but is also responsible for insulation against the cold temperatures in the winter, and the harmful rays of the sun in the summer. Shaving a dog’s natural coat is effectively removing his insulation and leaving him exposed to unnecessary risks including sunburn (even skin cancer! ), alopecia, and heat stroke. Additionally, without the guard-coat, your dog’s skin is left exposed to environmental contaminates like pollens which can cause hotspots and itchiness in sensitive dogs. A dog does not sweat through his skin, but through the pads of his feet and by open-mouth panting. A shaved coat will come back thicker and coarser than a natural coat and will cause the need for additional grooming and a potentially coarser coat. Your dog will cool better by circulating air THROUGH his coat rather than having air flow OVER his body. An oscillating fan is a great option for keeping your dog cool. Properly removing the undercoat with a professional deshedding treatment will not only keep the hairballs in your house to a minimum, but will keep your dog properly insulated during all seasons of the year. 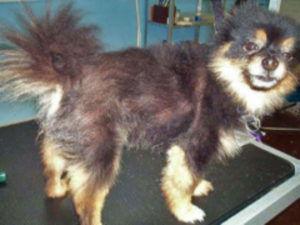 The best example I’ve ever heard to describe a dog’s natural undercoat was from Poppy’s Pet Parlour in London. “Think of a healthy double-coat as an old-growth forest. There is a balance with different parts providing different benefits. If you clear-cut an old growth forest, there will be immediate regrowth of a lot of young trees very soon. Unfortunately, they won’t initially be the same kind as those you cut down. Instead the forest has to start from scratch and spend decades, first growing ground cover and softwoods that provide an environment for the slower growing hardwood varieties. It takes generations before the natural balance is restored. There are some situations where there really are no other options than to shave your double-coated dog. If there’s a skin condition requiring topical treatment or severe matting, shaving is really your best option. But if your motivation for a shave down on your Golden Retriever, etc. is simply to help keep them cool in the heat, please think about what you’ve read here and see your groomer for a heavy deshedding treatment rather than causing potentially permanent damage to their beautiful, functional coat.